Turmeric is a glorious ingredient! This is no shy or subtle spice. Its vibrant yellow orange color seems to blast an announcement of its strong flavor and abundant medicinal qualities. A rhizome in the ginger family, turmeric is as earthy as the soil it is pulled from, with a peppery, warm, and mildly bitter flavor, with a fragrance slightly reminiscent of orange and ginger. Turmeric grows plentifully in hot, wet climates such as Bali’s and is a major ingredient in Indonesian health tonics and cuisine. Turmeric’s bright orange color indicates that it contains a high degree of beta carotene, the compound our bodies use to make vitamin A. Turmeric is an excellent source of both iron and manganese, vitamin B6, dietary fiber, and potassium. Turmeric has been harvested for over 5,000 years; since the Biblical era turmeric has fragranced perfumes, spiced food and dyed clothing, and its scientific name, curcuma, is derived from Arabic. Written records of its use in traditional Chinese and Ayurvedic medicine go back almost 1,500 years. Native to Indonesia and southern India — in fact the bright red forehead mark worn by some Hindu women is created by mixing turmeric with lime juice — turmeric has long been a part of the medicinal and culinary culture of the region. The list of health benefits turmeric provides is so long, and the scientific research so vastly documented, it is hard to do it justice in this brief introduction. Suffice it to say that turmeric offers abundant gifts to our bodies as a powerful antioxidant, anti-inflammatory, antiviral, antibacterial, and antifungal agent with the potential to address numerous chronic illnesses. Indonesians even use turmeric topically on cuts and sores due to its antiseptic qualities. OK! OK! How can I eat more of this stuff? 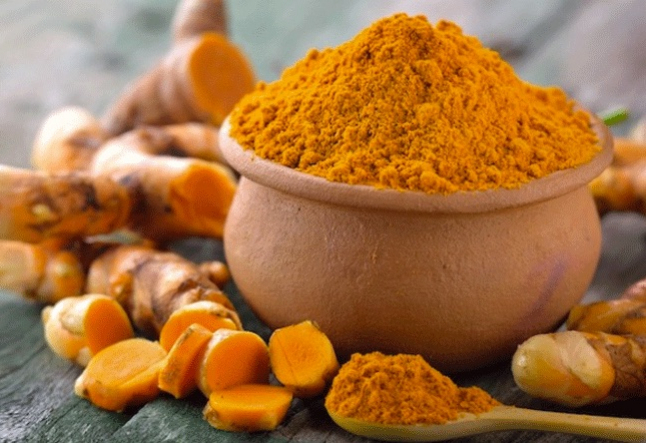 Ready to up the intake of turmeric in your diet? Here are some easy and tasty ideas to bring fresh, raw turmeric into your meals! When purchasing, look for turmeric roots that are not shriveled and have a vibrant yellow-orange color when broken open. Store your fresh turmeric in a cool, dark place or in the fridge where it will last for at least a week. Although it does not hold its rich yellow color in the sun, turmeric has been long used as a dying agent. Just look at your fingers when cutting raw turmeric and you’ll immediately be aware of its potency as a dye. (Try white vinegar for color removal). This root is highly revered in Ayurvedic medicine, as well as general South Asian cuisine. Native to Southern Asia, the name curcuma comes from the Arabic word “kurkum”, or “saffron”, and is an indication of its relationship to the vibrant orange color of both herbs. Since Biblical times, turmeric has been used to spice foods, make perfume, and color clothing. Here are 4 ways you can enjoy turmeric in your cuisine - Creamy Yellow Salad Dressing, Jamu Kunyit , Living Cauliflower “Couscous."